I had a good Friday. A Friday so good it reminded me of an episode of Sgt Bilko when it was his lucky day and nothing could go wrong, only he didn’t realise until the last moment when he bet on a horse that was winning, but at one second past midnight it dropped dead on the track. That sort of a Friday, which I celebrated with a lot of alcohol and it finished with a text from an old mate who had a spare Grand Final ticket. Next day my old mate and Eagles tragic Parko was running late, so I nursed my hangover at the MCG with a hot dog, but no coffee. If I had any more coffee I would have spent all my grand final lining up at the dunny; these are the things you have to take into consideration when you get older. As I sat and devoured my replenishing hot dog a nervy Pies supporter lit up a durry next to me. He told me he’d been at the ground since 7.30am and had only had three hours sleep, because he was so nervous. He pulled on that durry so hard it disappeared to ash in the blink of an eye and he shuffled off into the ground with both of us wishing each other luck and not quite meaning it. Parko, who has always had magnificent timing, arrived so that we missed all the pre-game entertainment; perfect timing still, just footy today. The seats had a great view, but on Grand Final day space is at a premium and I was seated between Parko and a Pies supporter in a shiny grey suit, bad teeth and a buzz cut with a mullet that looked like a three inch squirrel hair paintbrush attached to his neck. There was a community feel at the ground, supporters united in nervous energy that didn’t extend to baiting the opposition like the rest of the year. A surprising amount of people sang the national anthem and then with the bounce I endured a first quarter from hell. The Pies dominated so much that my Pie friend next to me would jump up and clap and pump his fists so hard his elbows came very close to whacking me in the head. Nothing was going well on the field and I ended up imploring my suited Pies friend to “please don’t hit me in the head”, which I’m betting was a phrase he’s heard before. My hangover was strongly suggesting that I go to a local pub and just quietly watch the shellacking from there. Parko told me he considered the same thing until two last-minute goals gave us a small hope. Grand final day at the MCG is a community of a hundred thousand people witnessing the greatest theatre in the land. Only this was more than the best Shakespeare you ever saw, in the first quarter it was more like watching Kramer Versus Kramer performed by Transformers. The rest of the match was watched through face palm fingers as West Coast clawed there way back over three more quarters to the soundtrack of half cheers, full blooded roars, applause, sighs and groans. In the last quarter the match turned into Lawrence of Arabia starring Indiana Jones. Mere points separated the teams as my my Pie friend was so worried he grabbed my forearm like a child scared of getting lost in Myers and asked me if the Pies could win. I told him I went for the opposition and maybe he should ask someone in a Collingwood scarf. He looked at me like a wounded calf and went back to cheering for his favourite player Crumbs every time the ball hit the turf. 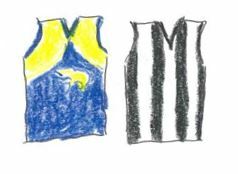 When Sheed kicked that famous final goal it was like Indy reaching back under the closing granite door to grab his hat, but it was no relief as me and Parko spent the last three minutes imploring the gods to “just blow the bloody siren”. When the siren finally went Parko and I turned, grabbed each other by the shoulder and screamed way too close to each other’s face. When I turned to my right my Pies friend was a shell, his dangerous elbows hanging limply by his side. “Don’t worry, you’ll be back” I said with real affection for the little bloke. “I know” he said and when next I turned back he was gone. When the game was over I was exhausted. My brother rang from Perth to say how lucky I was to witness a classic. “Was it?” I replied, “I don’t know I didn’t have time to think”, but maybe I just had my Sgt Bilko lucky day. A fun read, Matt. And great to share a shandy with on Friday. Two great days, and back-to-back. Funny you not realising it was a classic because of no time to think. Myself too, only coming to light after while walking from the G to the Windsor. I also got a ticket, but it was obtained at the usual time of 2pm Saturday. Sounds like a fair weekend all round, Matty. Hard to argue with the Eagles win. Really could have won by about 4 goals if they’d kicked straight when on top. Despite the Pies’ best efforts. When you’re hot you’re hot, Matty Q. Instead of a wet patch you hit a purple patch. Good idea not having the extra coffee ! I haven’t had a drink for three years and I still feel hungover after Saturday’s events. Played Matty Q. I reckon I drank my year’s beer ration in a week, so I dips me lid to someone who did it in a day. Now feel like I played 4 quarters, rather than watched them. Your body must have done a whole season. Post season surgery? Liver transplant? There is a little part of the MCG that is forever Perth. Drop by St Dominics Shrine next time you are over. It was wild. Well done West Coast. Well Done Matty. Yes it was a weekend to give it a nudge. We had a big arvo @ the RSL, then off to the bowling club, partaking in a lot of cold bevvies on the big day. The GF was great viewing, with the Pies starting so well, your blokes slowed it down, stabilised the game, the Pies got away again, but then the Eagle landed. A GF to savour. A very big weekend for you, old mate Sgt Bilko. Thanks all for your kind words, especially Sean Gorman, because I know it must have nearly killed him to say something nice about West Coast. I reckon you’re among the votes. It must have been a cracker of a match Matt for you to put up and handle so much interference! And this: “The rest of the match was watched through face palm fingers as West Coast clawed there way back over three more quarters to the soundtrack of half cheers, full blooded roars, applause, sighs and groans.” That a great film, play and concert rolled into one. Enjoy the next 360 something days as Premiers. Thanks Dave, Rulebook and Ricky (who knows a thing or 2 about premierships). I can now reveal that when I texted my brother that I was feeling hungover and he said “good, vomit on a Pies supporter”. Those Sandgropers hey? I have gripped many an adjacent opposition supporter’s thigh during those tight finals out at Stade Australie (Homebush!) It’s a pretty special human moment when it happens.